After vacationing and touring historic Boston last year, I was excited to see that I am related to William Copp, of Copp's Hill, one of our stops on the Freedom Trail. I just wish that I had known that when I was there, I would have paid a bit more attention. But, anyway, I took a lot of photos so I have a good idea of what it looks like today. Of course it looked nothing like today's Boston landscape back when William first landed in the Massachusetts Bay Colony and made his home on the Shawmet peninsula. At that time there were multiple hills in Boston; Beacon Hill, the three hills known collectively as Trimount, and what would become known as Copp's Hill. Like many of my early American ancestors, there is quite a bit of confusing information floating about the internet pertaining to William. A search of ancestry.com and findagrave.com will give you some, what I believe to be, false information. So, after a bit of digging, here is what I think I know about William Copp. In January of 1653, Anthony Coppe of Honiley, Warwickshire, England wrote his will. In this document he made a bequest to his brother, William Coppe, who was in New England. Honiley is a very small village in Warwickshire not too far from the town of Warwick and Kenilworth Castle. There was no church in Honiley until after the mid seventeen hundreds, so there are no Honiley Parish records that pertain to William and his family. 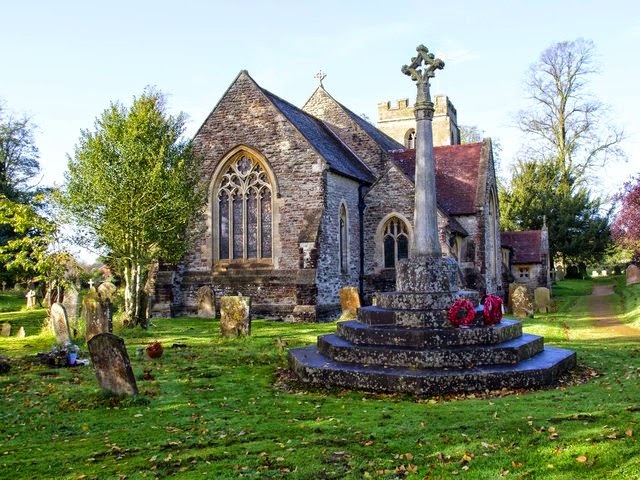 To find any records of the Copp family, you have to look in the nearby village of Hatton and its parish church of Holy Trinity. The Hatton Parish register of marriages began in 1538. Access to the marriage records is easily available online. The first marriage of interest was on 28 Feb 1575, it was the marriage of Thomas Coppe and Isabel Gunn. Thomas and Isabel are believed to have been the parents of William and Anthony Copp. Thomas was a yeoman in the hamlet of Beausale, which is in the parish of Hatton. His father may have been the John Coppe who leased a messuage and a close called "Round Table" in Beausale in 1545. (a messuage is land that a house is built on, and a close is a tract of land) In 1624 Thomas Coppe paid a yearly rent of two fat pigs and a goose for "Round Table" close. The lease on the land being passed down through the family. Thomas Coppe wrote his will in 1624 and died in 1628.. According to other researchers, he called himself Thomas Coppe the elder of Bewsall, yeoman in the countie of Warwick. In his will he named his wife Isabel, sons: Walter, Anthony, Matthew, John, Thomas and William, and daughter Ursula. Anthony Coppe named in his will his brothers William and Walter. This confirms relationship between Thomas and William as father and son. There are so many old records now readily available to use today on the internet that sometimes we believe that they are all a mouse click away. This is not true as I have found in my search for information on William and his family. The early baptismal and burial records from the Hatton parish are not online, and are available only from the records office which holds the originals. The baptismal records seem to be the source of the date frequently given for William's baptismal date of 9 November 1589. Getting a look at these original records is expensive and time consuming, so I am putting my trust in other researchers such as Samuel Copp Worthen, who have provided the information and references. Although William was baptized at Holy Trinity in Hatton, his parents lived in Beausale, so I see no reason to say that he was born any place other than Beausale. If you have seen the originals, please let me know. The first internet available entry related to William Coop is his marriage to Ann Rogers on 24 November 1615. Two children, whose father was William's Coppe, were baptized at Holy Trinity, Hatton. The first was John Coppe, bp. on 26 May 1622 and the second Johan bp. 15 October 1625. What's interesting about this is that there was an 8 year gap between the marriage of William and Anne and the first baptism of a child. Were there other children who were baptized elsewhere or went unrecorded at Hatton, or are there pages missing, or did it take eight years to concieve their first child? We know that William was married to an Ann, but when he arrived in Boston he was married to a woman named Goodith. So, what happened to Ann and who was Goodith? According to the internet, Anne died in 1633, and William married Goodith Icthener on 24 July 1634, but did he? According to the parish records Goodith Itchener married at Holy Trinity, on that July day, not William Copp but William Cox. That right, not Coppe but Cox. So what are we to make of this, is it a medieval typo or is it correct. A lot of people believe that William Copp sailed for Massachusetts on the Blessing in 1635 with his brother Richard. The men were recorded as William Cope age 26 and Richard Cope age 24. There are several reasons why I do not think this is correct. First, William was 46 years old in 1635. Also, there is no indication that he had a brother named Richard. But, I think the most compelling reason to believe that it was not him is that he was granted a lease of land in Hatton in 1636, the year after the Blessing sailed for Massachusetts. As Robert Charles Anderson points out in his Great Migration bio of William Cope, William Copp did not make an appearance in the Boston records until July 1640. By 1640 William and his family had arrived in Boston. William lived on what became known as Copp's Hill in the North End of Boston. He owned a house and one half an acre near the mill pond. The hill was previously known as Windmill Hill and Snow Hill, it was not called Copp's Hill until about the time of the American Revolution. Beginning in 1659 part of the hill was used as a burial ground. William and Goodith became members of the First Church of Boston, he in 1640 and Goodith in 1642. Their children, newborn and older children were baptized in the church. William's family would have listened to the preaching of the famous Rev. John Cotton a highly respected Puritan clergyman. William became a Freeman in 1641. He was a cordwainer, shoe maker, by occupation and he was chosen to serve as one of the first four "sealers of leather" in Boston. The sealers would monitor leather for its quality, etc. In an interesting case that came before the General Court in 1641, William was found guilty of concealing a prison break. The prisoner was Thomas Owen who apparently had an adulterous affair with a woman named Sara Hales. Thomas was given a strange punishment which involved having a hanging rope placed around his neck. He was to sit for one hour on a ladder at the gallows with the end of the rope hung over the gallows. Sara was given the same punishment but she was also to be banished from the colony. Thomas and Sara broke out of prison and their whereabouts were hidden by a group of men and women in Boston. The pair must have been found as both faced new fines and if unable to pay they were to be whipped. William Copp was fined the pair. This seems to be his only infraction. Sarah Norden and Mary Harvey, five pounds each. William also owned 100 acres of land near Braintree, Massachusetts. He divided the land between his children and grandchildren. An inventory of the estate was done on 15 March 1669/70. William buried at least five of his children, Goodith outlived William, but not by long. She died 25 March 1670. Goodith is buried on Copp's Hill and her headstone survived to this day. William was, I'm sure also buried in the hilltop graveyard along with some of their children.